One of the UK's finest soul/party bands, Souled Out is much more than just a band. Performing not only classic soul hits, including songs from The Commitments, Blues Brothers, Wilson Pickett, Otis Reading, James Brown and a whole host of legendary artistes, the band plays the whole spectrum of dance music from 50's through to present day chart hits and has earned the reputation as one of the most exciting dance/show bands in the country. Since it's formation in 1993, leader John Catherall has taken the band to great heights, performing at events in The Café Royal, The Grosvenor House Hotel, Alexandra Palace and many other prestigious venues across London, the UK and Europe. Souled Out have appeared with star names such as Alexander O'Neil, Bobby Davro, Mike Reid, Duncan Norvelle, Ruby Turner and The Drifters and have established a reputation as one of the country's leading show bands. A ten-piece band with a sensational brass team, the band plays much more than just soul music. Souled Out gives its own special treatment to hits from the 50's through to the present day, with costume changes and choreographed dance routines to make for a great all round entertainment spectacular. 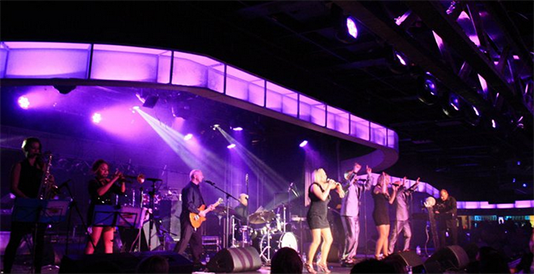 From weddings and bar-mitzvah parties to charity balls and corporate events, Souled Out give it everything, every time. The full line-up consists of four lead vocalists, guitar, bass, drums, keyboards, sax and trumpet which comes together to produce a powerful musical experience and a highly entertaining visual stage show. If you want a great party with real soul music that your audience will remember for a long, long time, you need Souled Out.